Prambanan is named after the village in which it is found and is the biggest temple complex in Java. The temple is located about 15 kilometers from Yogyakarta. The temple is dedicated to the 3 Hindu Divinities. It is an outstanding example of Siva art in Indonesia, and to an extension, to the region. The complex was built in the 9th century and comprises of 224 temples. In the complex’s inner square, you will find 16 temples, with the most significant one being the 47 meter high Siva temple that is flanked by the Brahma temple to the north and a Vishnu temple to the south. 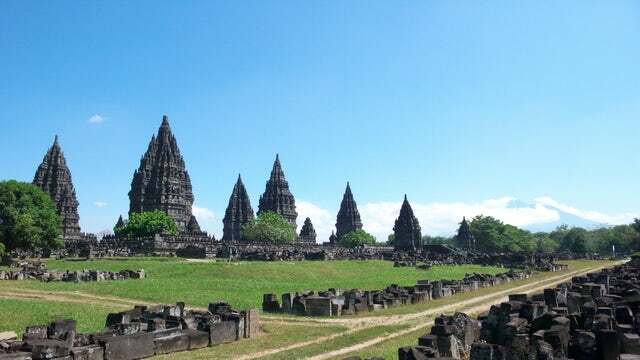 The Siva, Brahma and Vishnu Temples are locally referred to as the Prambanan Temple or the Lorojonggrang Temple. In the complex, you will find a square platform divided into concentric courts by square plane walls. In the center of the temple, you will find 3 smaller temples dedicated to the 3 Hindu gods. Each of the temples features animal vehicles for the gods with a swan for Vishnu, Bull for Siva and Eagle for Brahma. The Brahma temple contains the Brahma statue and the Vishnu Temple contains the Vishnu Statue. In the Vishnu temple is carved the story of Kresnayana, while the Brahma temple houses the continuous story of the Ramayana. The temples of Siva, Vishnu and Brahma are decorated with reliefs illustrating the Ramayana period. This is one of the sites in the whole of Asia where you can see and learn the history of the three Hindu gods. Trust me; there is no better place to visit for an insight into Hinduism than this historic site.